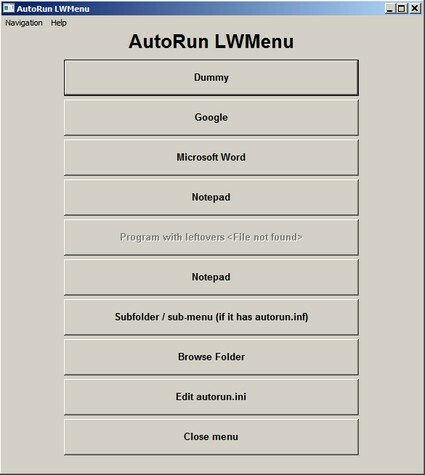 AutoRun LWMenu is a freeware (May 2017 update, as originally it was a time unlimited shareware). It's a control menu that can launch applications, URLs, system commands, etc. The thing is that it's not only portable itself, but can make the launched apps portable too (like PortableApps, not like JauntePE). You basically get the benefits of PortableApps Suite without having to download the whole package + set up PortableApps Launcher for each and every semi-portable program out there that's not official supported by PortableApps. Now that it's freeware, please help make it public. If you have the program and autorun.inf within the same folder, and still see only the built-in buttons, it probably means your system doesn't give the program access to autorun.inf. Is the Edit button grayed out with a "File not found" message? Or can you click it? Did you enter the program directly or through a shrotcut? A shortcut may accidentally be configured to use another folder than the one autorun.inf resides in. Enter Autorun.inf's properties, unblock it if it's blocked (see screenshot), and click OK. Although in my newer OS, it works even without doing this. If none of these steps help, I can't trace this problem in my own system. I can give you a special version that will output some error checking. 1. Is the Edit button grayed out with a "File not found" message? Or can you click it? folder than the one autorun.inf resides in. 3. Enter Autorun.inf's properties, unblock it if it's blocked (see screenshot), and click OK.
Last edited by TP109 on Sat May 27, 2017 8:24 am, edited 1 time in total. Then I have to rely on you to see where's the problem. It's supposed to output the relevant error. Please give me a screenshot. Last edited by lwc on Sat May 27, 2017 10:00 am, edited 1 time in total. Looking at that error, it seems likely that it could be related to auto-run being disabled. Going to take a look at my registry settings. If the error is due to registry settings for auto-run, I'm not sure it would be a good idea to change that just to run this program. I must have changed that a while ago for security reasons, but forgot about it over time. And if that is the cause, if I'm experiencing this problem, others surely will too. Not certain that using an inf file is really a good idea in the first place. An ini file should be less problematic I would think. The program uses Autorun.inf because it originated from the need to put menus in CD-ROMs. What I don't understand is if it's blocked for you, how can your Notepad open it? Last edited by lwc on Sat May 27, 2017 12:41 pm, edited 1 time in total. So there is access to Autorun.inf, but only if I treat it like a plain text file, how weird. Last edited by lwc on Sat May 27, 2017 3:40 pm, edited 1 time in total. That worked. If the intention is to use an ini file going forward, then the name AutoRun LWMenu wouldn't apply. This program really needs to be re-evaluated a bit more, including its UI IMO. This is what this thread is for. Your input is valuable. Let's see if the issue involves all your INF files or just Autorun.inf specifically. Last edited by lwc on Sun May 28, 2017 3:24 am, edited 1 time in total. TP109 reporting sir. It worked. Same screenshot as before. Alright, please rename back to Autorun.inf. 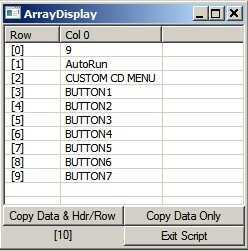 My program makes a global call to Autorun.inf to pull its sections and then specific calls for each section. The following version makes a bypass for the global call. If it works, you'll see a prompt of the list of sections. Last edited by lwc on Sun May 28, 2017 8:29 am, edited 2 times in total. Edit: Got a couple of things confused because I'm testing from two different folders and had executed from both. Below are the correct screenshots. Last edited by TP109 on Sun May 28, 2017 5:00 am, edited 5 times in total.